Protector 22mm Titan RL Version Short-Link Chain Only Discounts Apply ! *New* *Upgraded* Protector 22mm Titan *Short-Link* Absolutely Massive High Security chain! The biggest and beefiest production security chain in the world, as far as we know! Guaranteed impossible to bolt-crop by hand (select length below) and a challenge even for angle grinders. Sold Secure Motorcycle Diamond. Approx 24kg for a 2.0m length (chain is approx 12kg/m). Please beware that this is an extremely heavy duty chain and it is suitable for only the most severe security applications. It is literally twice the weight of our 19mm chain, and that is already heavy duty! Please do not order this unless you are confident that you really need such an extreme chain, and that you are going to be able to handle it and fit it through whatever item(s) you need to secure. It is a beast! We reserve the right to make a restocking charge if you order it and then need to return it. This is the "RL" RoundLock version, suitable for our RoundLock, only. *Not* compatible with the Squire SS80CS (see "EEL" Version) or any other locks. Click for the Bennetts league table. Click for the Bennetts review in conjunction with our RoundLock. Click for the Bennetts review in conjunction with the Squire SS80CS padlock. 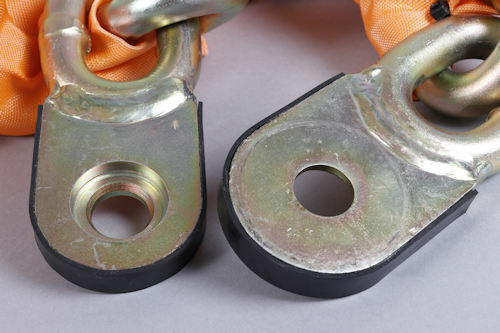 Note that this is a short-link chain so its links can't be interlocked in the same way as our other Protector chains. This is why we offer this Titan Short-Link chain in two versions: with special machined plates welded onto each end ("RL" Version, to suit our RoundLock, only); or with a single Elongated End Link ("EEL" Version, to suit the Squire SS80CS, Assa Abloy PL362, and other conventional locks with sufficient capacity to take such a large chain). Please Note: This is a specialist item and stock may be limited in some lengths, and other lengths may be available at times. Beware: This chain will only fit very few padlocks and very few ground anchors! Our Package Deals include this chain combined with appropriate locks. Shipping: Note that this chain is so heavy that we will have to ship longer lengths on a pallet, or you will have to arrange to collect from our premises. I couldn't wait to get my hands on the new 'TITAN' 22mm chain, to upgrade again, my permanent garage security layout. My bikes mean everything to me, and I wasn't disappointed......this chain is a 'BEAST' ! I have to say that I am very impressed by this imposing setup. I am genuinely hoping that any would be thief will look at the chain, lock and ground anchor and try their luck somewhere else!